As businesses become more distributed, network perimeters are starting to dissolve. 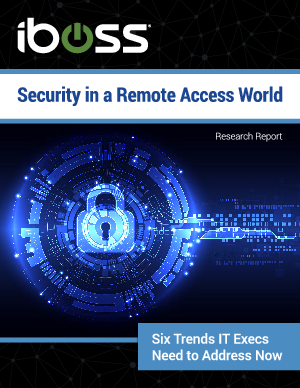 A workforce where employees are always on the go is now the norm rather than the exception, and a wealth of devices — both BYOD and professional tools — are putting unprecedented strains on IT resources. These trends are causing a spike in bandwidth needs across organizations, which on its own requires companies to beef up their network capacity to support remote locations and mobile users. As networks themselves are growing and evolving, so too are cybersecurity threats, which are taking advantage of blurring network perimeters and strained IT operations to execute their attacks. How confident are U.S. IT executives in their ability to keep their companies safe from cybersecurity threats and scale to meet the growing demands on their networks? On behalf of iboss, Researchscape conducted an online survey of 104 U.S. IT executives at large enterprises to better understand attitudes and initiatives for addressing cybersecurity.